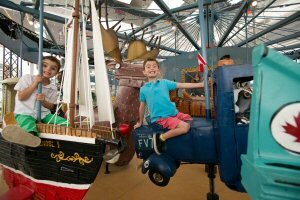 TORONTO, ONTARIO--(Marketwired - June 28, 2016) - The Pride of Canada Carousel, a 50-foot, one-of-a-kind merry-go-round featuring 44 rideable sculptures was unveiled at a private preview event, today, Tuesday June 28, 2016 in Downtown Markham. The Carousel will make its public debut at a free Canada Day celebration, noon to 5:00 p.m., Friday July 1 at 162 Enterprise and Birchmount in Downtown Markham. Canada Day celebrants will take free fantastical rides on the sculpture characters including a beaver, a bumblebee, a massive moose, a mermaid, a Canadian Mountie and more, all made from repurposed materials forming ingenious works of art. In addition to free carousel rides, the Pride of Canada Carousel July 1 celebration will feature, free cotton candy, air brush tattoo artist, mini Canadian flags, balloons twister, water station and costumed stilt characters inspired by the sculptures. A live BelloSound DJ will play the best of Canadian music. Beaver Tails will be on hand and The Great Canadian Food Truck and Caplansky's will be curbside for the festivities. Across the street at 169 Enterprise Road, the Canada Day block party features more free activities with face painting, live music from Los Moralitos at 3.00 p.m., 5.15 p.m. and 6.15 p.m. and Awash with Flames: the Billions Cobra Show at 4:15 p.m. in the square. The centrepiece of the celebration, The Pride of Canada Carousel is a spectacular interactive art piece created by notable, Canadian-born, California-based urban folk artist, Patrick Amiot, who is a master at creating art out of found objects. Amiot works in tandem with his wife Brigitte Laurent. The creative duo work side-by-side out of Sebastopol, California, Patrick sculpts while Brigitte paints. The Pride of Canada Carousel is many things - a piece of kinetic art, whimsy and engineering in motion, a joyful lifestyle connection to tradition and a bucket list destination for globetrotters who seek an old-fashioned ride on a 21st Century Carousel. The legendary Daniel Horenberger of Brass Ring Carousel Company built the Carousel structure. Some of his notable carousels include Disneyland's King Arthur Carrousel and the General Electric solar-powered Carousolar. The Pride of Canada Carousel is housed in a dramatic open glass pavilion designed by acclaimed Toronto-based architect Sheldon Levitt of Quadrangle, Architects, Ltd. and will serve as a cultural anchor and meeting place in the 243-acre Downtown Markham development. The Pride of Canada Carousel will soon join the ranks of Jane's Carousel in Brooklyn, New York and Pier 39 Carousel in San Francisco. Christopher Bratty of The Remington Group, the pre-eminent real estate and development firm behind Downtown Markham, commissioned the Carousel to be a centerpiece of The Remington Contemporary Art Gallery (RCAG) The Remington Group's ambitious $25 million public art initiative in Downtown Markham. Commissioned pieces such as the Carousel are only part of Downtown Markham's public art story. The Remington Group endeavors to build a creative community with studio spaces, shows and exhibitions. Art will feature prominently throughout all 243 acres of Downtown Markham as the true live, work, play community evolves in the coming decades. Such as the development itself, RCAG will continue to push boundaries, helping shape a dynamic and truly original urban landscape. The Pride of Canada Carousel will be open seven days a week, 10:00 a.m. to 8:00 p.m., all year round.